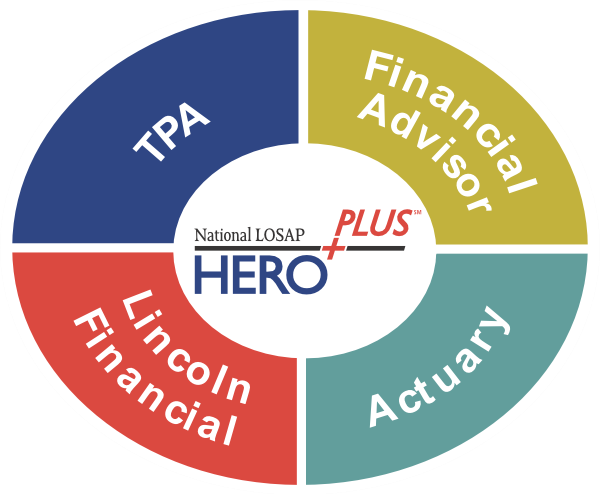 As your partner, the HEROPLUS℠ program makes it easy for you and your financial professional to work with Lincoln Financial, a Third Party Administrator (TPA) and an Actuary to create a LOSAP program that is tailored to meet your needs. Our turnkey approach helps to ensure a seamless transition to a customized HEROPLUS℠ program that will help you recruit, retain and reward your volunteers with confidence. As a HEROPLUS℠ program plan sponsor, you may offer either a defined contribution or defined benefit LOSAP plan to participants. A defined contribution plan defines the contribution the plan sponsor (sponsoring agency) makes to the participant’s plan. The plan sponsor makes a contribution annually. The plan can be established as either a fixed LOSAP contribution or a variable LOSAP contribution as determined by the plan sponsor. The plan sponsor contribution amount is based on the volunteer’s annual qualifying activity. The contribution is placed in the participant’s LOSAP account. The plan sponsor is responsible only for the contribution amount. The LOSAP participant selects the investment from available investment options. The outcome of the defined contribution LOSAP retirement account is dependent upon the performance of the investments selected by the participant. A defined benefit plan defines the benefit the participant receives at retirement. The commitment is made by the plan sponsor (sponsoring agency). The retirement payment to the participant is based on a predetermined dollar amount. This fixed dollar amount is paid to the volunteer participant at a specific retirement age, after the participant has met specific qualifications determined by the plan sponsor (e.g., time served, age and active volunteer activities). The plan sponsor is responsible for payment of the LOSAP retirement benefit to the participant. The participant makes no contributions to the defined benefit plan. Simply contact your financial services professional, TPA, or HEROPLUS℠ representative who will assist you in bringing the many advantages of the HEROPLUS℠ program to your organization.